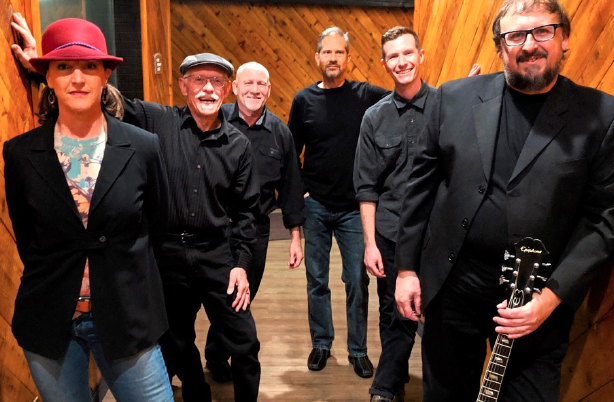 Mark Hummel Golden State – Lone Star Blues Revue will be playing at Pops Performing Arts & Cultural Center on Saturday, May 26. Blues Supergroup MARK HUMMEL GOLDEN STATE – LONE STAR BLUES REVUE, featuring Grammy-nominated Harp Blower/Vocalist/ Bandleader MARK HUMMEL, guitarist ANSON FUNDERBURGH (Delbert McClinton joining his Sany Beaches Cruise every year, Boz Scaggs, Snooks Eaglin, Earl King and Jimmy Buffet), and with guitar legend with MIKE KELLER – guitar (Fabulous Thunderbirds/Marcia Ball/The Keller Brothers) , drummer WES STARR and bassist RW GRIGSBY is an all-star cross country melding of California musicians Hummel and Grigsby with Texans Funderburgh, Keller and Starr. GOLDEN STATE – LONE STAR BLUES REVUE’s self-titled debut album (Electro-Fi Records/April 2016), was recorded by Kid Andersen at the famed Greaseland Studio in San Jose, CA, and co-produced by Funderburgh & Hummel. Harmonica man/singer/songwriter/bandleader/author/impresario MARK HUMMEL was born in New Haven, CT but moved to Los Angeles as a newborn. Hummel took up an interest in blues harp & rock-blues music in high school but soon discovered the originators like Muddy Waters, Sonny Boy Williamson & Little Walter. Soon after, Hummel frequented the Ash Grove club on Melrose Ave. in LA where he saw (in a three month period) three blues legends he would later work with on a regular basis; Charlie Musselwhite, Brownie McGhee (w/Sonny Terry) & James Cotton. By 1985 Mark Hummel’s Blues Survivors hit the road full time & continue till the present (Hummel’s memoir, “Big Road Blues: 12 Bars on I-80″ recounts many road exploits). In 2014 Blind Pig Records released “REMEMBERING LITTLE WALTER” (a recording of a Hummel Blues Harp Blowout.) The CD was nominated for a Grammy Award and won two Blues Music Awards. Hummel’s latest CD “THE HUSTLE IS REALLY ON” features GS/LS. 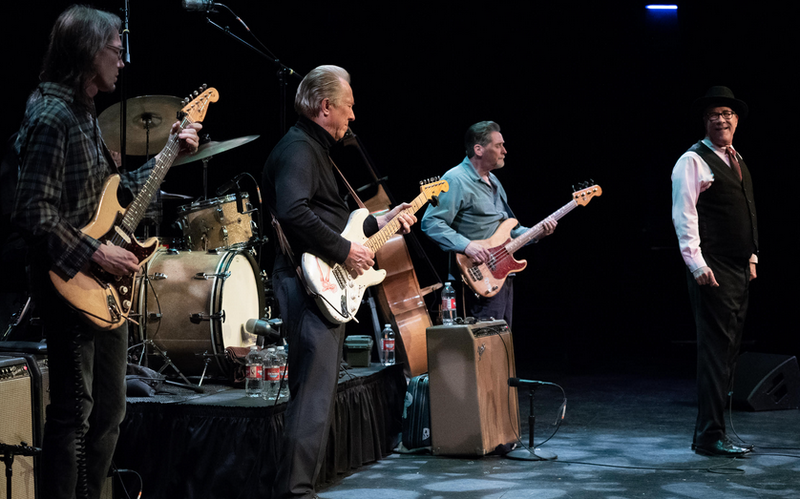 Long time Golden State/Lonestar Blues Revue guitarist ANSON FUNDERBURGH was born in 1954 in Plano, Texas where the youngster first picked up the guitar in high school and was hit by the blues bug through Jimmy Reed Lightnin’ Hopkins. By 1978 he had started Anson and the Rockets with vocalist/harmonica player Darrell Nulisch with the group being signed to Black Top Records a couple of years later. In 1986 Nulisch was replaced by Blind Sam Myers who stayed with the group until his death in 2006. The Rockets went on to win ten Blues Music Awards (formerly known as the W.C. Handy Blues Awards) widely regarded as the highest honor for blues artists in the United States. Guitar youngblood MIKE KELLER resides in Austin where he’s led his own band The Keller Brothers, plays in Little Elmo Blues Band, a sideman for Paul Oscher’s group plus did five years as a Fabulous Thunderbird, played two and a half years with SRV’s band Double Trouble, four years with Doyle Bramhall, recorded and toured with Marcia Ball for a year and a half and toured with the late harp genius Gary Primich. Mike’s solos are top notch in GOLDEN STATE-LONE STAR. Rounding out the GOLDEN STATE-LONE STAR BLUES REVUE are RW Grigsby on bass & famed Austin, Texas drummer Wes Starr. Between these two old Rome, GA natives, they’ve played with a who’s who of famed musicians – Omar & the Howlers, Junior Brown, Jimmy Vaughan, Asleep At The Wheel, Gary Primich, Kim Wilson, Mike Morgan, Carlene Carter, Hal Ketchum, Earl King, James Cotton & many more! • or by emailing sneedtribe@yahoo.com. For those of you interested in having dinner, you can order a Liza Wood Dinner. It will be Polenta Lasagna salad and cake for $15/person. Please email sneedtribe@yahoo.com by 2/18. Pops Performing Arts & Cultural Center is pleased to host The Scott Durbin Band on Saturday, February 16th at 7 pm. 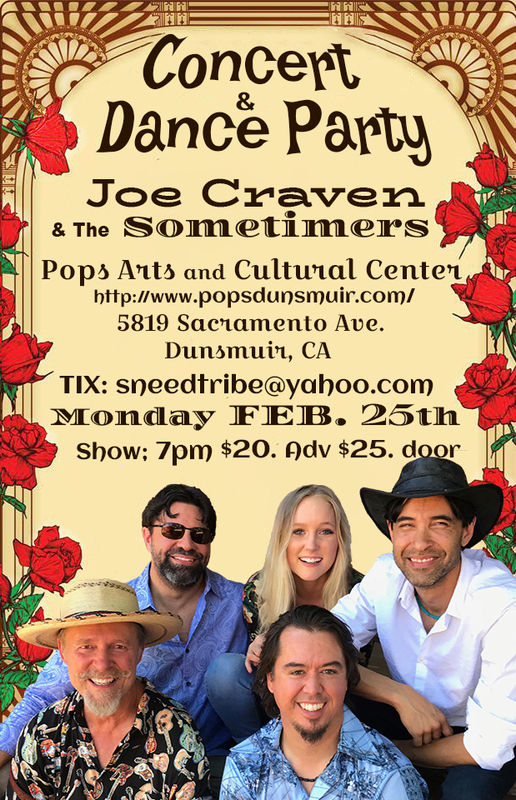 The Scott Durbin band features powerhouse blues and jazz singer Anna Repetto with Ross Perry, from Redding on drums, Nathan Sivanada, Mt Shasta resident, playing bass and newly added guitarist from L.A., Sultani Trip. The group is headed by Scott, who is a composer, arranger, keyboardist and trumpet player. His resume includes working with Stevie Wonder in the 60’s and 70’s as well as song writing and studio work for MoTown Records in the 80’s.